Laravel Doctrine – Best of Both Worlds? Laravel Doctrine is a drop-in implementation of the famous ORM for the Laravel 5.X Framework, and a really interesting alternative to the default choice, Eloquent. In this article, we will learn how to use it, and when. Why Doctrine, and not Eloquent? Active Record is about a strong coupling between database operations and the classes in our software. For many little projects this approach is more than fine, but what if our software grows in complexity? We could stumble upon the need for more classes, not always related to a specific table in our database. There, Active Record doesn’t help us achieve a good level of abstraction from the data source. the other main criticism is a direct consequence of the first: testability. If the model is tightly coupled to the database, building a test without it can be more difficult. It has to be said that a part of this problem can be reduced (not solved) with mocking and a good use of dependency injection. Now, in the same book we mentioned before, Martin Fowler explained another architectural pattern: the Data Mapper. The Data Mapper consists of the presence of an intermediate layer which, working in both directions, provides access to the data source on one hand, and a good abstraction from it on the other. This means that objects in the software are not closely related to the data source, with great improvement in terms of responsibility isolation. The result? The developer can now focus on building an object that is nearer to the real world situation, and not to the database system chosen for the job. Eloquent is an implementation of the Active Record pattern, and Doctrine is an implementation of Data Mapper. Let’s see how we can install Doctrine for Laravel, and how to configure and use it. As usual, we will use Homestead Improved as a standard development environment for our tests. Let’s create a new Laravel project. 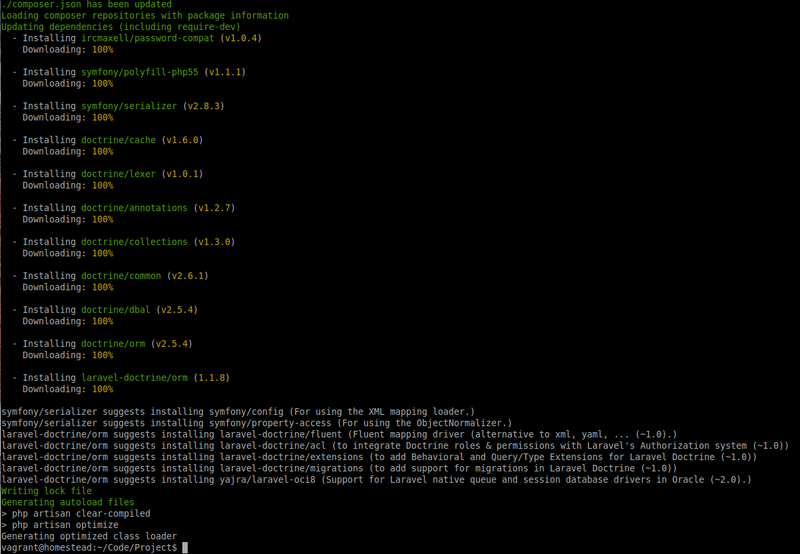 Then, we enter our project’s folder and add Laravel Doctrine as a dependency with Composer. We are done! Laravel Doctrine is completely installed and configured. The Example Application – ToDo List! In order to learn something more about Doctrine for Laravel, we are going to replicate an existing application example that uses Eloquent. What about the Intermediate Task List on Laravel’s official site? log into their own area. add a new task to the list. mark a task as done / not done. update an existing task in the list. delete an existing task from the list. Obviously, every user will be able to see only their own tasks. Let’s change the application’s namespace to TodoList first. Ok, now we can start from the very basics of Doctrine. In Eloquent, we used models. How do we start now? In Doctrine we use Entities to represent our application objects. Unlike with Eloquent where the model extends a base Model class, a Doctrine entity is a plain PHP class that does not extend anything. Not bad as a beginning. Yes, it’s a little more “verbose” than an Eloquent model. However, there is a specific reason for that. First of all, if we think about it, this is a plain PHP class. It says nothing about its implementation, has no extra responsibilities. Everything it does is strictly related to the task itself. That’s a good thing, because this approach is more “compatible” with the Single Responsibility Principle. In Eloquent, models are just an interface to the database. With some “magic”, sometimes without even writing a single line of code in the model, we can just start working with them. The only thing we have to do is design our database accordingly. With Doctrine, the key concept is a little bit different. Here, we start designing our application from our classes which represent the “real world” problem we want to solve. Then, we bind our classes to tables, and properties to columns. With these annotations (which we can find in the Doctrine\ORM\Mapping class), we bound the class and its properties to a specific structure in the database. In this case, to a tasks table that has an id, name and description field. #  Database schema created successfully! Let’s check what happened in the database with a tool of our choice (or from the CLI). with annotations, we added some meta data in our class, without really modifying it in a significant way. Annotations are comments, after all. Sounds great, right? Now we can start working with it. Let’s do some tests before diving deeper. Now that we have a database for our application, we should start figuring out how to insert new tasks and read them. For this purpose, at a basic level, we can use the EntityManager class. … and execute it by browsing to the test-add URL. Once done, we verify the data. The EntityManager is a special class which takes instances of entities and “translates” them into database records. As we can clearly see, the persistence responsibility is not related to the model/entity any more. But why two separate methods? What about the good old save? Well, things are a little different. the persist method is used to give a specific instruction to the EntityManager class. It says “hey EntityManager, when I give you the signal, persist the entity”. the flush method is used to execute the instruction we previously gave the EntityManager – the signal it needed. The EntityManager is not just about adding entities. We can easily use it to find instances of existing ones. Let’s try to find the one we just added, in another find-test route. If we check the URL, sure enough, that’s our previously inserted item! Ok, time to move on from the basics and start having some fun with our intended real project. We are going to start with the Tasks area. We will learn how to add, edit, remove and list them. Then, we will “protect” our items by introducing a user system in which every user will only see their own tasks. Let’s start by creating a dedicated controller for Tasks. We can leave it empty for now. In the resources/views folder, let’s create a very basic master layout that every view will use. We will call it master.blade.php. The next step is creating the form. Let’s create a new file named add.blade.php. The postAdd method has the logic we need to add a new item. As seen above, we are creating our entity and then saving it with persist followed by flush. $tasks will contain the tasks list. Every element of this list is an instance of the Task entity we built before. No magic methods, no properties that we don’t remember… just methods we have created, keeping it clean! Now, to the controller! We can see something new in getIndex: the getRepository method. Put simply, a Repository is an object with a very specific responsibility: deal with the persistence layer, starting from (or arriving to) simple entities. This means that we can continue treating our entities like plain PHP object but with the benefit of an easy persistence layer management. For more information about the repository pattern, please see here. We can build a repository for every entity we have in our software, but Doctrine makes our life simpler by giving the EntityManager a getRepository method that creates a really basic repository with the most used methods. findAll is one of these methods. The result of our search is put in the $tasks variable and passed to the view. Let us now see how to switch a task’s status from “not done” to “done” and vice-versa. Let’s create a getToggle method in the TaskController that will respond to the toggle/STATUS_ID URL. We can see that we didn’t use a persist method this time around. We called the toggleStatus method of our entity and then used flush. That’s because we already saved this entity in our database – we just need to update a single, existing property value to a different one. We just used our existing entity’s logic without putting anything in the controller. Tomorrow, we could change everything in the framework, yet the business logic (the toggleStatus method) would have the same effect. Let’s allow for the deletion of items now. The EntityManager automatically takes care of the task deletion process with the remove method. We can add a link in the “Operations” table column in our view to let the user delete a specific task. Let’s create an edit.blade.php view. Now, to the controller: let’s add the getEdit and the postEdit methods. Finally, let’s add the operation in the tasks list. Now, how can we define a specific link between two entities? Let’s continue our exploration of Doctrine with more examples. To do this, we will need a new entity: the User. * Assigns the $task task to the current user. With the OneToMany annotation, we are defining a new one to many relationship between the User entity and the Task one. We are also specifying that this property will be an ArrayCollection, a structure that Doctrine uses for this purpose. We’ve also defined a couple of methods to access the current user’s tasks and add a new one. … and then, a couple of methods to set and get the user instance. Obviously, before going forward, we’ll need an “updated” version of our database to be sure that everything will work fine. The above command will update the schema structure according to our entities. Ok, test things out with the help of a test-rel temporary route. It works! This is just an example, but the Doctrine documentation covers every kind of relationship you could need for your application. With Eloquent, authenticating was very, very easy. By default, the chosen driver for the authentication system was “eloquent” and the User model was already there. With a little customization, the Doctrine approach can be just as simple. Laravel Doctrine gives us a cool trait to handle all the required operations for the interface we want to implement. So, let’s edit the User entity. Note: this trait will also add two new columns to our users table (password and remember_token). Now we just have to change the config values in the config/auth.php file. More specifically, the ones in the providers array. Once we’re done, we can move on to the log in phase. We make a new view, login.blade.php. Let’s “protect” our TaskController with the auth middleware and create two routes (GET and POST) for the login procedure in the routes.php file. Note: there’s also a test-user route to add a sample user. Even though we have defined a relationship, a task doesn’t have its owner yet. We can quickly fix this. Let’s add a call to the User::setUser method in the TaskController::postAdd one. By calling the getTasks method, we get all the tasks for the given user. In this case, as Auth::user returns an instance of the current user, we get only the logged in user’s tasks. Our first test application with Laravel Doctrine is complete! It wasn’t hard, was it? It should be noted that Laravel Doctrine has support for validation and can help us do password resets. Likewise, it supports multiple database connections for our entities just like native Laravel has for models. Last but not least, in this test application we touched on repositories. However, we were not using them at their full potential. In fact, we can extend the Doctrine EntityRepository when we need a specific set of functionalities more focused on the domain problem at hand. The related page in the documentation contains a lot of interesting information. Have you used Laravel Doctrine? Would you? Why / why not? Let us know in the comments! Francesco is a web developer and consultant from Italy. He is the founder of Laravel-Italia, the official Italian Laravel Community, and writes for HTML.IT, the first italian web development portal. He also translated some books about Laravel. In the meantime he follows other projects, works as a freelance backend consultant for PHP applications and studies IT Engineering in Rome. He loves to learn new things, not only about PHP or development but everything. He hopes to work for IBM, sooner or later.